Climate scientists have been working for decades to understand our impact on this planet. Yet all the facts and evidence relating to this crisis are still rejected outright by some, dismissed as an irrelevance by others. 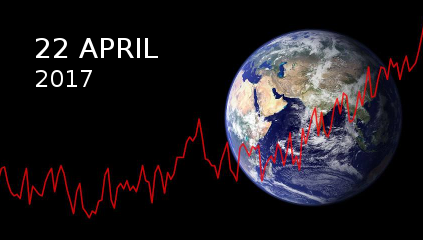 As Trump pushes to slash the US climate research budget, we'll be joining the London March for Science on 22 April in solidarity. Just as importantly we're calling on the UK government to act in accordance with its own climate commitments, not wishful thinking and alternative facts. The March for Science originated in the US as a celebration of passion for science and a call to support and safeguard the scientific community. Trump's policy changes have caused heightened worry among scientists, and the incredible and immediate outpouring of support has made clear that these concerns are also shared by hundreds of thousands of people around the world. The mischaracterization of science as a partisan issue, which has given policymakers permission to reject overwhelming evidence, is a critical and urgent matter. Scientists in the US are calling for everyone who supports scientific research and evidence-based policies to take a public stand and be counted. All are welcome on the climate bloc! You can join the march on our facebook event.